The Community Book Drive is a partnership of the Hagerstown Area Religious Council, United Way of Washington County, Hagerstown Rotary Club, the Early Childhood Advisory Council (ECAC), and FedEx Ground. Last year more than 14,000 books were collected and used through the new Community Book Warehouse, which is distributing them to community organizations, schools and individuals to get them into the hands of vulnerable children. If your group would like to collect books for the book drive, please contact Terri Gwizdala at gwizzy2000@gmail.com or Kathy Powderly at kathy.harc@gmail.com or 301-842-4272. Visit the Early Childhood Advisory Council website for more information about early childhood education and literacy in Washington County. 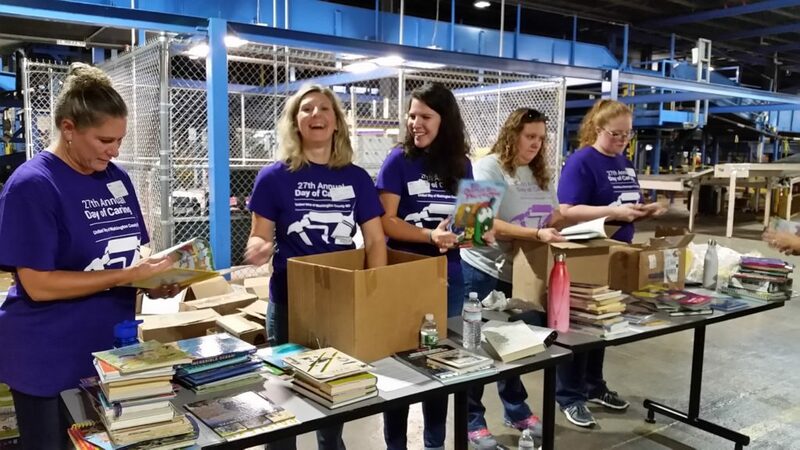 Books will be picked up from participating collection sites September 13-18 by FedEx Ground volunteer drivers and will be sorted and counted on the United Way Day of Caring, Thursday, September 19. Collected books will be distributed throughout the community where most needed for early childhood literacy programs and vulnerable children.